The sickle-weilding weasel is located in the northeast corner of the Upper Waterfall area. You can find him there during the morning and afternoon hours. If you talk to him you'll get the chance to help him cut weeds away from his favorite flowers. 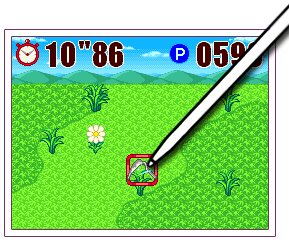 On the DS touch screen you will need to cut the weeds that sprout up from the ground. You can do so by either tapping the weeds with your stylus, dragging the stylus around the screen, or moving the sickle around with the directional pad and pressing A to cut. You have 30 seconds to cut as many weeds as you can. The easiest way to get a high score is to tap each weed with the stylus. Dragging the stylus around the touch screen means you'll be crossing over and cutting the delicate flowers, and using the directional controls takes too much time. After you play the mini game during the story-mode, you can return to the Upper Waterfall area to play the game again. You will have to give a fish to the weasel in order to start the game, and he will only have a need for a weed assistant during the morning hours.